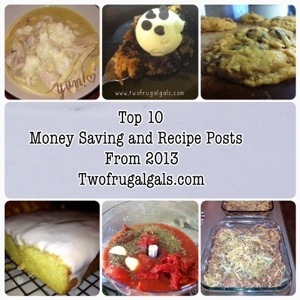 It’s always fun to look back to see which recipes and Money Saving post on Two Frugal Gals were most popular in terms of traffic in 2013. Here is this year’s top 10 most read posts in 2013. If you haven’t read them, be sure to check them out. And while you are at it, feel free to save them to Pinterest!